Leon Panetta was careful to argue in Asia the U.S. isn’t trying to contain China. Was he convincing? But most onlookers, including the United States’ own allies in the region, believe such assurances are disingenuous. It would be hard for even the most novice policy analyst to conceive that China’s ever-growing defense spending, which has increased by 500 percent in the past 13 years, is a non-factor in the new U.S. calculation. Beijing officials are said to be vexed by Washington’s activism in Asia, and it was perhaps more than a mere scheduling conflict that kept senior Beijing officials from attending the Shangri-La Dialogue this year (last year, then-secretary Robert Gates and Chinese defense minister Liang Guanglie held talks on the conference’s periphery). The envisioned U.S. pivot to Asia levies long-standing alliances in the region, while also cultivating new partnerships. In his address at Shangri-La, Panetta noted a new agreement with Singapore that will allow the United States to deploy four new Littoral Combat Ships to its main naval port in 2013. While in Singapore, Panetta also met with Philippine national defense secretary Voltaire Gazmin to discuss ways in which the newly-rejuvenated alliance could be further enhanced. After Singapore, Panetta then jetted to Vietnam, a partner whose geostrategic significance has elevated its status in the United States’ regional stratagem in recent years. To the dismay of many human rights activists, while in Singapore Panetta suggested that the United States is even open to improving military ties with Burma should the country continue on its current reform trajectory. Some onlookers thought it strange that Thailand, a longtime U.S. ally, wasn’t on the secretary’s Asia itinerary – perhaps owing to the recent censorship clampdown and the increasingly sensitive political climate there. However, Joint Chiefs of Staff Chairman Martin Dempsey did travel to Bangkok, where he met with Prime Minister Yingluck Shinawatra and Thai defense officials. Among the topics of conversation was the creation of a joint center of excellence in Thailand devoted to humanitarian assistance and disaster relief. While previous U.S. participation at Shangri-La has often focused on the issue of Taiwan and the North Korean threat, the South China Sea as a flashpoint for conflict was the threat du jour at this year’s conference. In his address, Panetta asserted the United States’ role as a the preeminent guardian of the commons, and, without explicitly reprimanding China for its recent heavy-handedness, noted that U.S. was closely monitoring the situation in Scarborough Shoal and was absolutely opposed to “provocation,” “coercion” and “the use of force.” He also urged all territorial claimants to further develop a code of conduct and settle on a mechanism for dispute resolution. One topic that was paid seemingly little attention was terrorism. Panetta, former director of the Central Intelligence Agency, only mentioned terrorism fleetingly in his address – while describing U.S. relations with the Philippines. As the Philippines, Indonesia, and other ASEAN countries remain homes to some of the world’s most radical Islamic elements, and in light of February’s bombing by an Iranian militant in Bangkok, it’s surprising that threat reduction and cooperation on terrorism was not given a more prominent spot on the U.S. agenda this trip. 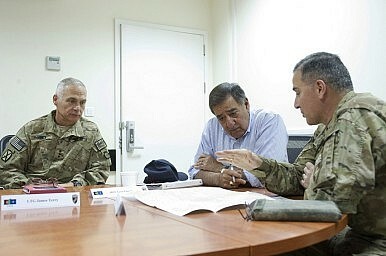 Following the conference, Panetta traveled to Vietnam, where he gave an address from the flight deck of the USNS Richard E. Byrd in Cam Ranh Bay. The secretary recognized the seventeenth anniversary of the normalization of relations between the United States and Vietnam, and restated Washington’s commitment to helping Vietnam defend its national interests. Although Panetta never mentioned China in his address, the Middle Kingdom nevertheless loomed large in the consciousness of everyone onboard. As the New York Times does an excellent job of describing, Vietnam is facing the precarious challenge of walking a tightrope between the two powers. While Hanoi views enhanced corporation with the United States as an important buffer to growing Chinese influence, it remains ever-sensitive to offending its northern neighbor. Vietnam’s distrust of China is linked to its own self-view, a historical narrative that centers on over two thousand years of fending off foreign aggression, namely by China. But, despite the deep-seated mistrust, China remains Vietnam’s single most important bilateral relationship and the leading proprietor of Vietnam’s trade deficit. Elizabeth Leader is a Research Associate for Southeast Asia at the Council on Foreign Relations. This entry originally appeared at Asia Unbound here. Whether it’s a pivot or a rebalancing, the U.S. clearly has its eyes on a rising China when making policy.